For a prospect who only played two regular season games with the Sarnia Sting this year, what happened on Friday night speaks volumes about the player he really is. 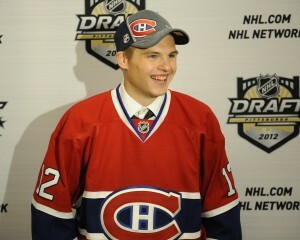 Alex Galchenyuk was the third player chosen in the 2012 NHL Entry Draft, going behind only Nail Yakupov, one of his best friends at Sarnia, and Ryan Murray, the top defenseman available. 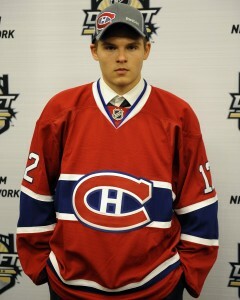 Coming into the season, Galchenyuk was considered a high-end talent with the potential to go first overall. A season destroyed by a torn ACL ended those hopes, but it’s clear Galchenyuk has the talent to be a superstar in the National Hockey League someday. The Habs’ first rounder and Milwaukee, Wisconsin native is the son of a former professional hockey player, and holds American citizenship. Because of his last name, many people assume he’s Russian. Galchenyuk has made it clear he is from the United States and is here to stay. “A lot of people were pretty impressed when they saw him up close in person,” said Matt Nichol, a Toronto-based trainer who along with Gary Roberts works with elite prospects and NHL players. “He’s just a big, strong guy, and he trains extremely hard,” Nichol told The Globe & Mail. That’s precisely the kind of player the Montreal Canadiens are looking for, and Galchenyuk couldn’t be happier to be the latest top selection of one of the most storied clubs in hockey. Galchenyuk is widely viewed as a risky pick, but he has shown in the past that he can handle pressure. The first overall pick in the 2010 OHL Priority Selection, he’s had pressure mounted on his shoulders for years. So far, he’s shown he’s more than capable of handling it. Good thing too, because he’s being thrust into a city that breathes, eats, and sleeps Canadiens hockey. At 6’0″, 200 pounds, Galchenyuk is the big, exciting centre Habs Nation has been craving. He brings high expectations with him, and Canadiens fans will need to be patient, as he may not necessarily step into their lineup right away. Players like Yakupov, who is the first overall selection of the Edmonton Oilers, are more than ready to make the jump to the NHL. Ryan Murray, the second overall pick of the Columbus Blue Jackets, will also be expected to make the leap. But Galchenyuk is in a different situation, and though Montreal’s loyal fans would love to see him wearing the bleu, blanc, et rouge next season, Galchenyuk may need to get back into the swing of things with the Sting first. Galchenyuk excelled playing alongside Yakupov, putting up 83 point in 68 games during his rookie season with Sarnia. Now he’ll be expected to score goals without elite talent on his wing, but Canadiens fans shouldn’t worry about a lack of point production. In spite of the high risk involved when drafting a player based on the previous season’s performance, Galchenyuk has shown he’s worthy of being chosen third overall. This was general manager Marc Bergevin’s first real opportunity to make his mark, and after reviewing their selections, Montreal appears to have had an absolutely outstanding draft. One scout said on Saturday morning that every player the Canadiens picked was in his top fifty. Get excited, Habs fans, because your future just became a whole lot brighter.